The June Medal was played in good weather last Sunday and it was a familiar name at the top of the leaderboard, Shaun Carter won his second competition in a row with a quite brilliant nett 63 to blow the field away. Shaun hasn't been a member for long but has seen his handicap drop from 27 to 19 in just a few weeks and he is certainly an early contender for the Most Improved Golfer award we give out at the end of the season. Junior golfer Kieran Underwood continued his steady season with a second place finish after a nett 65 and third place went to Ian Tier who had a great finish of two birdies on his last three holes to score a nett 68. The joint Order of Merit leaders are Steve Bond and Paul Underwood tied on 27 points, the Eclectic nett and gross leader is Dave Johnson. The next competition coming up is the Colin Maddock Trophy on Sunday 15th June which is also the last day of the US Open. The golf season is now well and truly in full swing and the second major of the season - the US Open, which usually proves to be the toughest in terms of scoring and course set up, is taking place next week at Pinehurst Number 2. If you haven't got SKY TV at home all the coverage will be shown in our clubhouse. With leading players such as Adam Scott and Rory McIlroy winning tournaments recently, things are certainly hotting up amongst the world's top players as the US Open fast approaches. Even without Tiger Woods in the field it should again prove to be a great tournament played on one of the world's greatest golf courses. Look out for our popular sweepstake in the shop now with tickets priced at just £1 each and a £100 voucher for the winner as the first prize, there is also a voucher for 2nd place and for the player that finishes last after round 2 - but hurry as tickets are going fast! 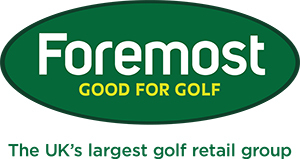 We were very pleased to be asked to be part of the new TaylorMade Team Loft Up, this is a select group of golf retailers (there are only ten in the whole of the north-west) that offer golfers expert knowledge and fitting of the highest standard on the full range of latest TaylorMade products. I was lucky enough to get presented with some new TaylorMade Team Loft Up clothing and goodies presented to me by their north-west Area Sales Manager Stuart Hubbard. "It's been a busy few weeks since my last course report, the temperatures are rising and we are getting our fair share of rain which is encouraging the swards to grow. I was reading an article the other week on a greenkeeping website about repairing pitch marks, if a pitch mark is repaired in the first 5 minutes of happening then it will recover within 24 hours however if a pitch mark isn't repaired then it can take up to 30 days to recover depending on the depth and damaged caused - please try your best to repair your pitch mark and any others that you see it really does help to improve the condition of the greens. Over the next few weeks we shall be verti-cutting the greens, followed by a double cut and a light top dressing, as well as carrying on with our monthly wetting agent applications, seaweed applications and liquid feeds as and when needed. The tees were fertilised 3 weeks ago with a slow release granular fertiliser which was washed in nicely with all the rain that fell in May - one good thing about the rain! The square patch behind the 2nd green which was stripped last year for repair jobs will be re-seeded within the next couple of weeks and roped off, this will then be used again next year as a little turf nursery to repair any worn or damaged areas." Elspeth Forbes was very pleased to tell me that the Ladies recorded a convincing win last week when playing in a friendly match at nearby Woodside Golf Club - the result was 3.5 to 0.5. The fact that they won so well away from home makes the victory even better, hopefully this win will spur them on to a good performance in their next West Cheshire Shield match on Monday at home to Eaton Golf Club. To commemorate Tiltleist being the most played golf ball at the US Open for the last 66 consecutive years they have released a limited edition ProV1 ball numbered '66', we have a small amount of these balls in stock and they are available at the normal price of £39.99 per dozen or 2 dozen for £75 . They would make a great collectors item or you can play a ball that you know will be unique and different to your playing partners, click here if you would like to reserve some before they sell out. 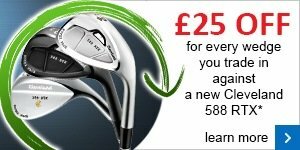 We have a great offer on new irons from Callaway and TaylorMade - any set of at least 7 irons either standard or custom made purchased from us will also include a FREE stand bag worth £99 , this is a great offer and one that will be running for a limited time only so if you would like to book a fitting and take advantage of this deal please contact me here. If you find yourself making mistakes towards the end of the round, it could be fatigue. A golf trolley can help conserve energy so you make fully committed swings right to the finish. We’re giving you the chance to trial a Motocaddy trolley over 18 holes so you can experience the benefits for yourself. Check out Motocaddy’s extensive line-up and ask us about taking one out…just bring your voucher into the shop and we’ll get you off and running! Now’s the time to master your irons as we’re offering you a FREE fit and FREE lesson when you buy a set of Callaway irons. 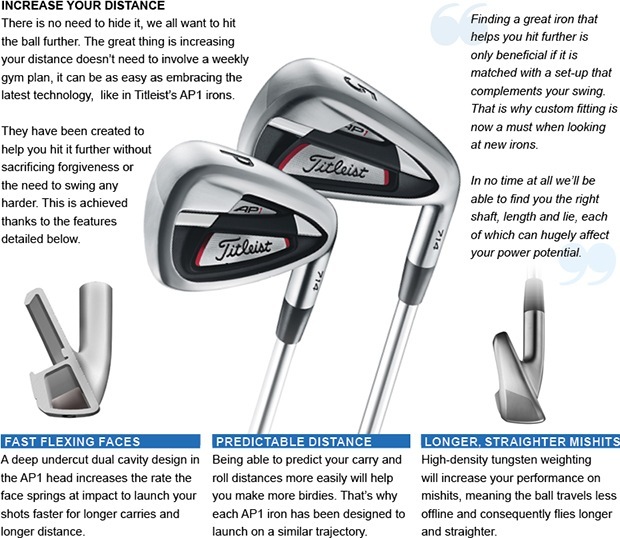 We want to help you enjoy better golf and find that consistency with your irons that you can only achieve with a proper fitting. Watch this short video to find out more. Technology is one thing, but sometimes it pays to have someone look over your swing. Don't hesitate to get in touch with us for some swing advice. 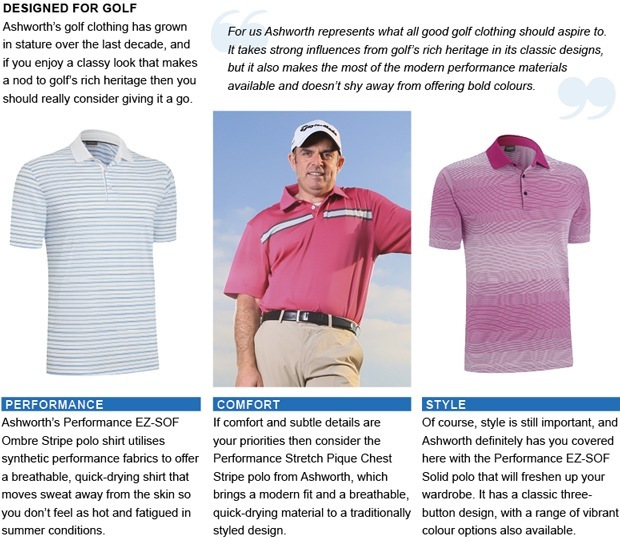 Take a look when you're next in and ask yourself if your golf wardrobe could do with a boost. adidas’ new gripmore sole is designed to blend the grip of a cleated shoe with spikeless versatility. Available on the adicross and pure 360 Sport models, the sole features directly-moulded, five-pronged flexible cleats, plus a bed of ‘microspikes’. The result? Serious traction….